We were a very diverse group of 50 including a number of SU faculty and staff as well as talented artists and storytellers. 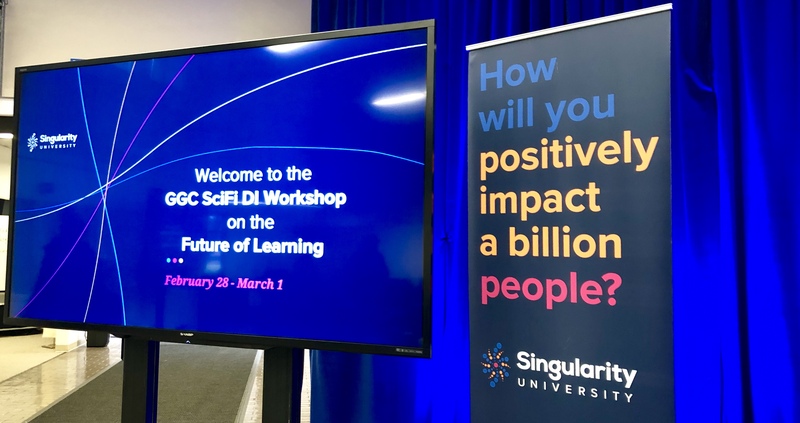 The workshop started with “deep immersion” to exponential thinking and technologies and how these would affect the future. Then we worked in groups of 3-5 using 7-8 worksheets. 7) Write a scenario/storyline using the character (setting the scene, normal day… until one day, solution and result) At this point we got help from the artists. All 12 groups presented their problems/solutions. We all got 4 votes each to cast on the favourite story/solution. The winner was the story of Nuni, an AI empathy and an educational bot and Yabi a 9 year-old kid living in Chad. Nuni checks Yabi’s individualized educational plans, creates digital content and most importantly, facilitates interaction with other children (real and virtual) by directing Yabi to interactive collaboration spaces. It also interacts with other Nuni’s to create a happy, healthy and safe learning environment. So using technology to increase human interaction. The beauty is that SU will make a comic book out of this and will be distributed to the public for free! This entry was posted in concept, education, innovative partnerships on March 16, 2019 by microfinance. 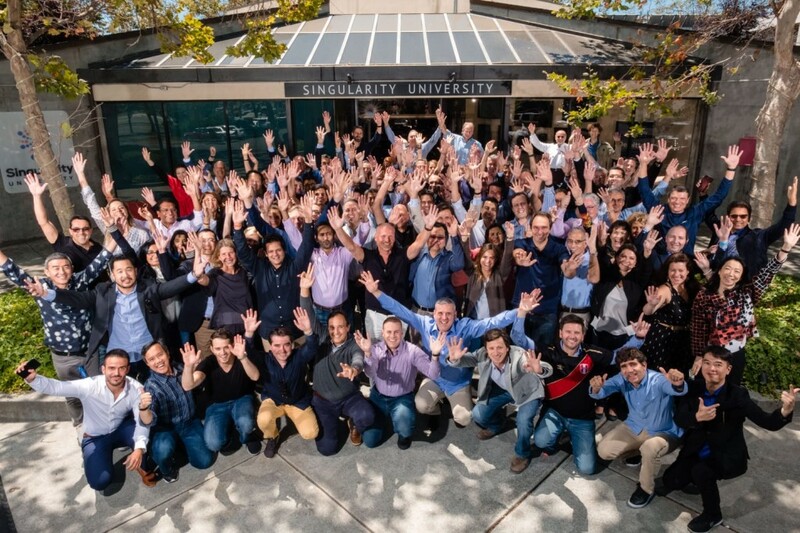 8 weeks have passed since the intense week at Singularity U, where 92 curious and fun minds were exposed to and learned from the awesome experts in the field of exponential technologies as well as from each other. -nanobots in our brains in 2030? -quantum/blockchain/solar/AI supremacy converging in 2025? We did learn a lot then, but now it feels that the executive program was just the beginning. We are sharing great stories and news, asking better questions, so we continue to accelerate our learning journey. We are also connecting people from our networks and aiming to scale the positive impact that we can create while finding solutions to the great challenges. How exciting it is imagining what we can achieve collectively over time! Thank you SU and SU colleagues! This entry was posted in concept, education, empowering people, innovative partnerships on September 21, 2018 by microfinance. On June 26th, I was fortunate to attend an exclusive event where Molly Bingham, the founder of Orb Media, philanthropist, filmmaker, photographer and journalist, shared with us her amazing journey. This event was organized by Women and Philanthropy (thank you Kecia Barkawi!). Molly is Founder and CEO of Orb Media, which produces a new kind of journalism that challenges the way we see our world and brings us together around the things we share. At a time when we most need to see the full picture of our planet, today’s journalism is showing us only fragments of it. As people, we have our differences, but we share a core that profoundly outweighs them. 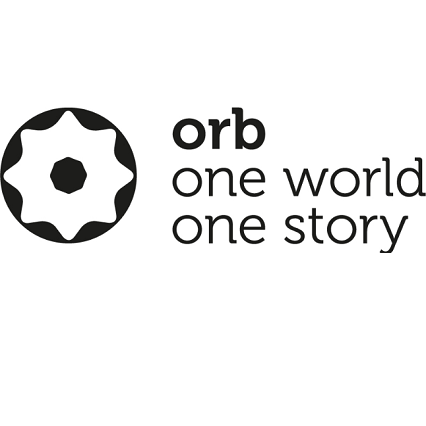 Orb Media is a nonprofit journalism organization that reports on issues that matter to billions of people around the globe. Fusing original research, data analysis, on the ground reporting, and an engaged public, Orb Media produces agenda-setting stories about the challenges we face together as one world. Some of their recent stories include Invisibles- The plastic inside us, a story revealing how plastic fibers have contaminated tap water around the world, this was followed by the alarming story Plus Plastic – Microplastics found in global bottled water and the most recent one is Age Well – attitudes matter in a graying world. All these stories are important to all of us in the interconnected world. Orb is remaking journalism to one that the world truly needs. I was also hugely impressed and inspired by Molly, her courage, dedication, passion, and her journey. Molly comes from generations of pioneering journalists, in fact, she is the 4th generation. She is an award-winning journalist, photojournalist and filmmaker. In 1994 she started as a photographer traveling to Rwanda to cover events after the genocide she continued to cover war areas such as Burundi, Zaire, Chiapas, Russia, Sudan, Sierra Leone, Afghanistan, the Gaza and Iraq. 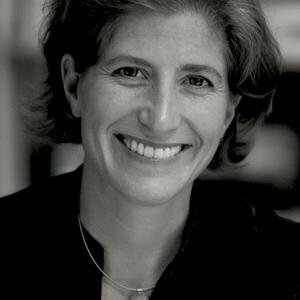 She has worked with Human Rights Watch for three projects and also worked as the official photographer of Vice President Al Gore at the White House. In 2003, she survived a 7-day captivity at Abu Ghraib prison in Baghdad. As co-director of the documentary film “Meeting Resistance” she was awarded the “Golden Award” at the 2007 Al Jazeera International Documentary Film Festival. Her passion and commitment to journalism which was tested through her experience in the prison in Baghdad has lead her to remake journalism to catalyze global dialogue and create massive positive change. Thank you Molly! Watch her powerful TEDxtalk. Molly Bingham at TEDxSMU. This entry was posted in concept, empowering people, innovative partnerships, platform, SDGs on June 29, 2018 by microfinance. 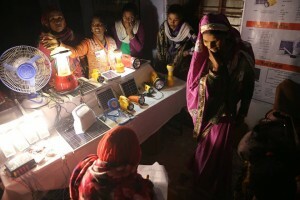 Barefoot College (BC), a not for profit, social innovation organization announced in early November the launch of Bindi Solar, the first global line of solar home lighting products fabricated, distributed, sold, installed, maintained and repaired exclusively by women. Bindi Solar products include; low cost solar home lighting systems, portable lanterns, micro grids, DC TVs and fans as well as a range of handheld solar lighting devices. Starting in India, Bindi Solar will be distributed through BC’s ground breaking partnerships with Frontier Markets and GHE as well as the Barefoot Solar Mamas trained across 15 states. Development of the new products has been made possible through the CSR collaborations with Apple, Goldman Sachs, the Phillipps Foundation and working in partnership with The Frey Charitable Foundation and EROL Foundation. Over the past 5 years there has been a powerful yet smooth transformation at this pioneering and innovative 45 year old organization that has been providing basic services and solutions to the challenges facing rural poor communities with the objective of making them self-sufficient and sustainable, valuing and respecting the knowledge and wisdom they already possess. BC was founded in 1972 by Sanjit “Bunker” Roy, following the life and work style of Mahatma Gandhi. Today, BC boasts a diverse and inclusive team of dedicated individuals from both formally educated and grass roots communities, working side by side towards impact of the critical issues facing rural poor communities in access to energy, water, sanitation, education and sustainable livelihood development. It is an exceptional example of decentralized management philosophy, capacity building from within to deliver what has become know globally as the “Barefoot Approach” to community development. BC has been committed to empowering women as change agents, entrepreneurs and environmental stewards. Believing that placing women at the heart of the development process is the most reliable and effective way to pass on the wisdom, knowledge and skills that all rural poor communities already possess and which are so often undervalued and under utilized. BC engages in building confidence and competence in individuals and entire communities bringing about large-scale shifts in values and sustainable quality of life enhancement. BC is one of the few Indian organizations that has successfully exported its models for development across the Global South through a unique and visionary partnership with the Government of India, Ministry of External Affairs ITEC program. This partnership has resulted in true “Made in India” technology by and for the rural poor reaching 78 countries in the developing world. Over the past few years this successful organization embarked to scale exponentially its operations in both depth and breadth. 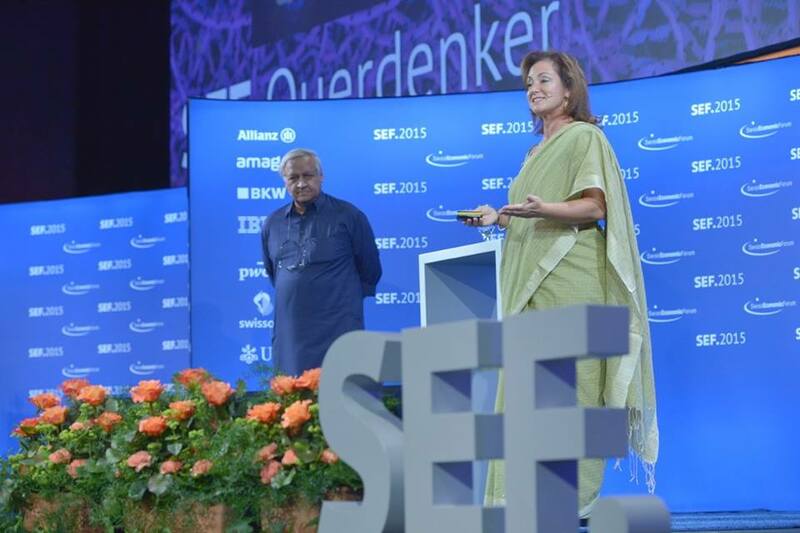 This launch of Bindi Solar is only one such example. The powerful yet smooth transformation seen so far is thanks to the amazing team work of Meagan Fallone, CEO together with Bunker and the awesome team of Barefoot College. BC is embracing the latest technologies and ways to work with it, embracing diversity and inclusion while maintaining the core values. This entry was posted in empowering people, innovative partnerships, social entrepreneurship, sustainability, Uncategorized on December 4, 2017 by microfinance. 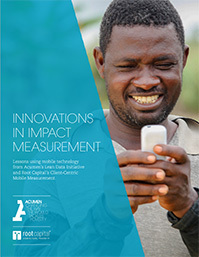 Last November, I attended an inspiring presentation by Acumen where I heard for the first time about their Lean Data Initiative for impact measurement. The main advantages of this approach are: collecting meaningful data through lean surveys in less time and with less cost by using low cost mobile technology. In addition, it can be used as an interactive tool, to not only measure, but manage impact as key data is collected efficiently providing a fast and clear insight of the social performance achieved. This is quite a revolution from the traditional impact measurement that was designed primarily for the use of donors and investors. This puts the customer/beneficiary first and it becomes a management tool for the service/product providers to improve their ongoing operations in order to deliver even higher social impact. Another pioneering organization that has been developing new tools and methodologies leveraging technology for measuring social and environmental impact is Root Capital. Root Capital is an agricultural impact investor that grows rural prosperity in Africa and Latin America by providing loans and training to agricultural enterprises that are reaching small-scale farmers. Root Capital’s Client-Centric Mobile Measurement aims to generate the data needed about impact on small-scale farmers, while creating value both for the farmers and for the agricultural enterprises. These innovations are significant as it will improve and increase positive social and environmental impact and also accelerate and increase investments for impact. This entry was posted in concept, empowering people, impact investments, innovative partnerships on September 20, 2017 by microfinance. 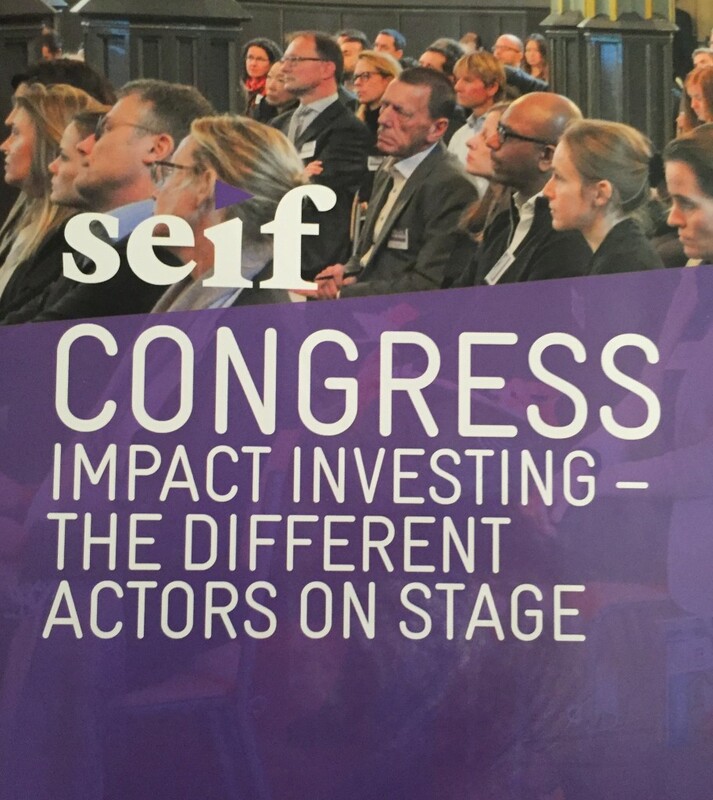 The 2nd Impact Investing Congress organized by seif took place in Zurich on Jan 24th. -The space continues to grow rapidly and somewhat chaotically as new players from all segments with different aspirations and products enter and push for mainstreaming impact investment. Growth is great and as a result you can’t avoid some growing pains. Some big banks such as BBVA and Barclays are becoming more active in this field. -Rod Schwarz, CEO of ClearlySo introduced the recently launched ClearlySo Atlas, an impact assessment solution for private equity investors and venture capital investors. Atlas asseses the impact of portfolio holdings enabling investors to map, track and report on their impact and sustainability. What is great about this tool is that it targets the mainstream investments managers/portfolios (not only the impact investments) to improve on its impact. This goes along with Rod’s and ClearlySo’s belief that we are moving from the two dimensional investment criteria (return vs risk) towards a three dimensional one adding impact as a feature to all investments. -Antoni Ballabriga , Global Head of Responsible Business at BBVA made an impressive presentation on how this large bank has recently gone through a transformation involving 28,000 of their employees around the globe to (re)define their purpose. The bank’s purpose is now “To bring the age of opportunity to everyone” and thus their new tagline is “Creating Opportunities”. With the WHY being cleared, the WHAT and HOW follows. 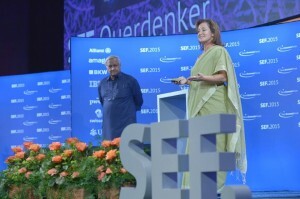 These opportunities will be offered through: financial products that meet individual customer needs; financial education programs; transparent, clear and responsible communication; commitment with the environment; support to entrepreneurship; and promotion of culture and science, among other initiatives in favor of society. Let’s see how the initiatives of another large financial player reshape the universe – for the time being let’s give them the benefit of doubt. 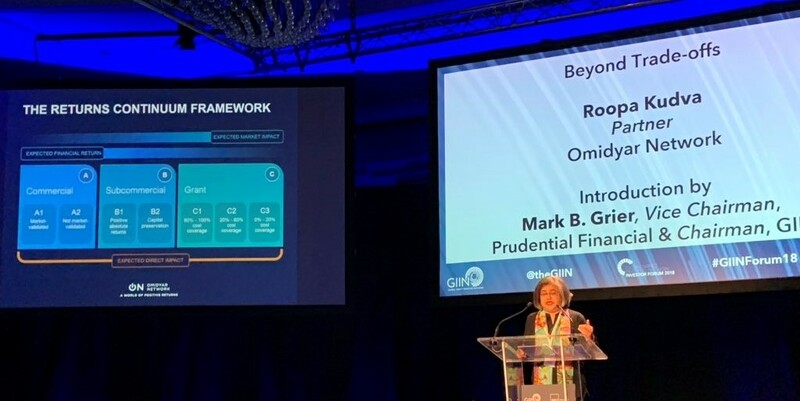 -Phyllis Costanza, CEO of UBS Optimus Foundation updated us on the positive results so far of their first Development Impact Bond, an innovative instrument which brings in new money and cross sector partnerships for development. They are working on a new DIB and hopefully many other DIBs would be launched by other institutions in the future. -The closing was a very interesting panel that debated on the now and future of impact investments in Switzerland which gave us much hope but equally cautions as the industry grows and mainstreams with differing views on the extent of the impact (improving some things vs solving the real problems) that the organizations would like to create. Thanks seif for organizing this productive Congress. This entry was posted in conference/symposium, impact investments, innovative partnerships, sustainability on January 31, 2017 by microfinance.